Reputedly ex Mars Factory, Slough. 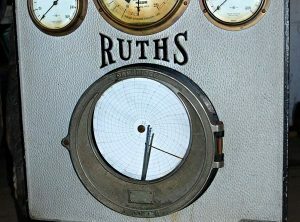 A very unusual large cast iron gauge board, 1930, for monitoring Ruths Patent Steam Storage System (- a factory boiler and steam accumulator system). Stands approx 40″ High. 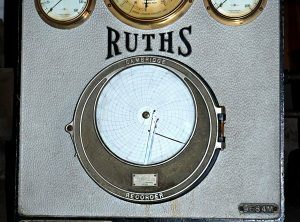 Features Cambridge Recorder, various pressure gauges (for accumulator, boiler, oil pressure, etc), plus brass plates with installation diagram and specs.